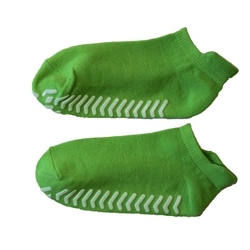 Our GREEN small ankle height STICKERS™ BRAND non slip socks measure 6- 7" inches in length. These socks are size small. They are made of 70% polyester, 25% spandex, and 5% elastic. They also feature non slip arrows on the bottom of the sock. Imported. Great for trampolines, gym use, home and hospital use or any other reason you might need a low cost non slip sock for kids and those with a small shoe size. Minimum Order is 20 pair.